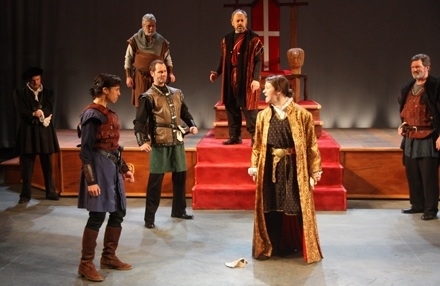 "Awash in medieval music, the Hangar's space has been simply but eloquently transformed by scenic designer AmArA...Costumer Lauren Cowdery again works her magic...This straightforward context allows the players — their actions and language — to take precedence. 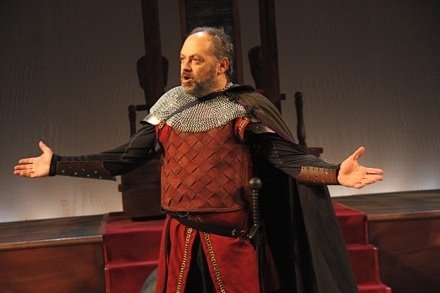 "Shakespeare endows Richard II with richly poetic speech, which renders him at times expressively persuasive and at others merely self-indulgent. 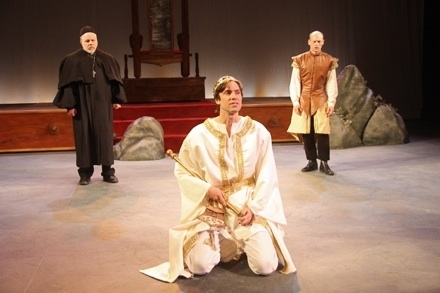 John Keese is well cast in this role — tall, youthful, and comely, as Richard actually was. Keese conveys the king's softness, artistic nature, unstable emotions, and above all, his complete identification with his royal role. If one speech drags somewhat, Keese makes up for it by the power of Richard's last discourse and the force of his final heroic struggle. "In contrast, Michael Donato's Bolingbroke is all rough manhood, but intelligent and strategic, not foolhardy. It's fascinating to watch Donato's performance grow more nuanced as the story progresses and Henry becomes increasingly aware of the multiple consequences of every action. As with Richard, his last moments onstage are exquisite, the cares of new kingship visibly piling on him. "An added prologue with a narrator introducing us to the royal line-up...supplements the rich program notes, but within minutes, we're beyond such introductions — the story is sufficiently riveting and handsomely (forgive the pun) executed. You'll come away pondering power and responsibility, the nature of identity and the vagaries of fate."